Abuja — The politics of carpet-crossing has resurrected. It has become an undying feature of Nigeria's party politics. Almost always, it comes with great promise of hope to launch a new strategy, deepen our democracy and deliver more democratic dividends. In most cases, the circumstances and excuses for party defection in a multiparty democracy have remained the same, but decamping time is both strategic and dynamic. This, perhaps, explains why there have been more of motions than actions. Across the states, it is the in-thing straggling all political parties, influencing supporters, party members and politicians. It is worrisome. But this instrument of strategic manoeuvre dates back to the first republic in 1951 and, heralded in the defunct Western Regional House of Assembly. As an overnight affair then, not a few members of the defunct National Council of Nigeria and Cameroon (NCNC), under the leadership of the late Nnamdi Azikiwe carpet-crossed to the then Action Group (AG), led by the late Chief Obafemi Awolowo. The unspoken motive for the mass defection was to sabotage Zik and his party, the expected political success of forming the majority in the Western Region House of Assembly, to enable Awolowo meet the requirement to form the government. That development, however, provided the opportunity for the AG to form the government in the region. In like manner, the first premier of the region, the late Ladoke Akintola, left the Action Group in a messier personality clash and founded the United Nigeria Democratic Party (UNDP), with the aim of launching the Yoruba into Nigeria's mainstream politics and romped into an alliance with the then Northern People's Congress, NPC. Successive republics were not exempted from defections and carpet-crossing. Ever since the country returned to democratic governance in 1999, this trend has increasingly become a recurring feature confronting Nigeria's democracy, leaving in its trail, political instability. The most recent major defection was in 2014 against the then ruling Peoples Democratic Party (PDP), where many gladiators were in for an irreconcilable position in the build-up to the 2015 general election and hurriedly formed a loose alliance with the then opposition All Progressives Congress (APC), a coalition of the defunct Congress for Progressive Change (CPC), All Nigeria Peoples Party (ANPP) and Action Congress of Nigeria (ACN). However, it seems the center can no longer hold for the APC founding members. There are imminent implosions threatening the APC in many states as exemplified by developments in Lagos, Imo, Kaduna, Kwara, Delta, Benue, Kogi, Rivers, Adamawa, Zamfara, Ebonyi and Kano. The last APC ward, local governments and state congresses were arguably weird and thus controversial. Very common were allegations of parallel exercises, hoarding of nomination forms, non-conduct of congresses and selection of delegates. Cleavages that ensued in the party pitted many stakeholders against one another along divergent interest lines. Disaffected party members repeatedly queried certain stated principles of the ruling political movement, bordering on internal democracy, openness and inclusiveness. Against that backdrop were also allegations of imposition, shortchanging, impunity and selective justice preferred against the APC leaders in the bid to place strategic positions and structures in the hands of their trusted allies. Palpable disquiet looms. Many public office holders are now rooting for intra-party and inter-party realignments. They are pulling out all the stops to actualise their 2019 ambitions. Possible options swing between the ruling APC and main opposition PDP. Up north, in Kaduna, Kano, Adamawa and Zamfara, APC membership is apparently loose. Two APC resourceful senators in the National Assembly, Suleiman Hunkuyi and Shehu Sani representing Kaduna north and Kaduna central senatorial districts respectively, left no one in doubt of their disaffection. Recently, APC potent groups in the state called Akida and Restoration under the leadership of the lawmakers jointly declared the withdrawal of their membership from the party. Also, Senator Rabiu Musa Kwankwaso, a former two-term governor of Kano State, has a seemingly irremediable disagreement with his successor and incumbent helmsman, Abdullahi Umar Ganduje. The lingering battle concerns, who controls the structure of the party in the state. But, Ganduje brazenly calls the shot as the incumbent governor. This premise does not sit well with Kwankwaso, given his immense contributions to APC's victory before and during the 2015 general election. The former Kano governor is now spoiling for a showdown come 2019 using his political grouping called, the Kwankwasiyya Movement. It was gathered that Kwankwaso is engaged in discussions with the opposition PDP and SDP to unseat the ruling party in the state and nationally. 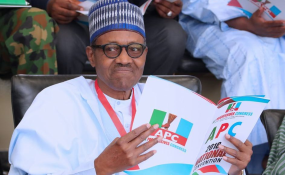 In Adamawa and Zamfara, the fate of APC is still hanging in the balance, because while Senator Abdulaziz Murtala Nyako and other supporters of President Muhammadu Buhari applied overnight tactics to dump the party for the African Democratic Congress (ADC), the defectors from PDP are waiting for Governor Jibrilla Bindow, to make a move. There is arm-twisting politics in Zamfara, involving Senator Kabir Marafa and Governor Abdullaziz Yari, following the lawmaker's ambition to unseat the incumbent governor. Also, possible mass defection looms in Kwara, Sokoto, Kogi, Bauchi and Benue states. Barring last minute change of heart, Senate President Bukola Saraki, House of Representatives Speaker, Yakubu Dogara and Governor Aminu Tambuwal, might be leading mass defection of a tsunami magnitude that would be a defining statement on the 2019 electoral direction. Hitherto, experts claim that absence of political ideology and internal party democracy in virtually all political parties almost always gives rise to unhealthy power contest and intra-party feuds. Lack of internal party democracy, in no small measure, prompted the exodus and emergence of the splinter groups like nPDP in 2013 that morphed at present into rAPC about three years later. However, investigations have shown that most politicians defect to other parties with promises of election tickets once they perceive their ambitions are under threats. Others, who feel discouraged or denied a level playing ground, carpet cross to participate in the election, with some nursing the ambition to return to their former parties. This raises apprehensions that the phenomenon could derail the country's democracy since its persistence and perilous impact impeach the presence, if any, of the parties' manifestos, thereby threatening a bleak future for the sustainability of party politics in Nigeria. Politics in the past was run and sustained with abiding ideologies and principles built gradually over time, unlike in contemporary times, where politics become a selfish grab for power, glory and riches. Considering its implications on quality of governance, peace and stability, it makes no room for a strong and credible opposition to sustain true democracy in Nigeria. Politics of selfish defection will also lead to no accountability, fair representation, good governance and democratic consolidation if it is allowed to continue unchecked.